When you need something to give your kitchen or powder room a punch, look no further than Fornasetti tiles. 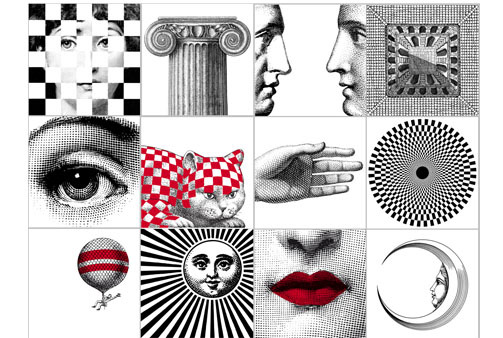 These are designed by Piero's daughter Barnaba Fornasetti. She used her father's extensive design vocabulary and came up with these brilliant hand-painted 8" square tiles. They came in a matte or glossy finish and are perfect for giving that powder room a bit of a va-va-voom. One can also frame these up as a wall decoration for a long hallway or use them as coasters (add felt circles under to prevent scratches to tables). I'm sure you can think of gazillion ways of put these tiles to good use. What would you use them for? 3.1 Phillip Lim sunglasses giveaway Round 2! The 3.1 Phillip Lim Spectacle/ Sunnies giveaway!